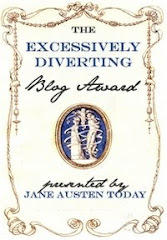 By popular demand, here are a few more sightings of the queen from around the blogosphere. The lovely photo shown here is by David Hill (you can view his amazing Flickr portfolio here). 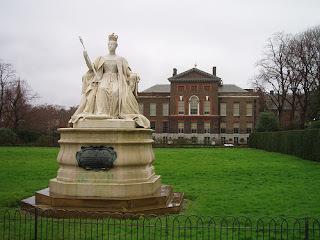 This marble statue, which faces east toward the Round Pond at Kensington Palace, was sculpted by Louise, the queen's sixth (and some say most talented) child. 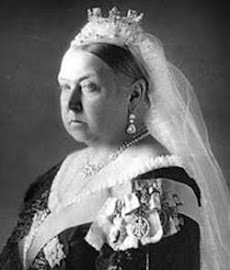 In 1857, Queen Victoria chose Ottawa as the new capital of the United Province of Canada. Here she visits the Library of Parliament to see how things are going. An en-fringed queen, with birds, in Malta. The queen unamused by snow in Toronto. On a pedestal in Birmingham. The queen directing tourists to Adventure Island in Southend-on-Sea. The queen on the lookout for French troops in Hastings. Green queen in Lancaster, in an outfit inspired by Scarlett O'Hara. The queen as Darth Vader in Canada ... and as Jabba the Hutt in India.